Current estimations suggest that Tony Hawk, world famous skateboarder, is worth upwards of $120 million. This is an impressive figure, made all the more impressive when you consider his work on behalf of charities over the years. In setting up the Tony Hawk foundation, there’s no doubt that some of his wealth has gone into this, which indicates that he could have amassed an even greater personal fortune, were it not for his philanthropic leanings. What Are the Other Skateboarders Worth? One thing that we can easily establish is that Tony Hawk is so far, the richest skateboarder of all time. What’s not quite as easy to determine, is whether or not he is likely to be eclipsed one day. First of all, let’s take a look at the net worth of a few other well known skateboarders. Bucky Lasek is a name known to many skate enthusiasts. We are shocked to say that his estimated net worth, after a long career is just $2.5 million. Not bad for someone with a great day job, but it doesn’t come close to The Birdman. Eric Koston is thought to be worth around 15 Million, which is a bit more like it, but it still pales into insignificance when set alongside the money Tony Hawk has made during his remarkable career. Why is Tony Hawk So Rich? A lot of people would say that Tony Hawk was just in the right place at the right time. He was at the forefront of the skating movement just when it exploded into the consciousness of teenagers across the globe. However, some people would say that this explosion of interest in the sport was driven by Tony Hawk himself. It’s fair to say that two things have landed him so high up in the tree. The first is his initial tie in with the Tony Hawk’s Pro Skater computer game, released in 1999, and the second is his ability, at the time achieved by no one else in the world, of pulling off a 900 on a vert ramp. Two and a half revolutions of his body while in the air and on his skateboard, while hurtling toward a vertical ramp – no wonder! 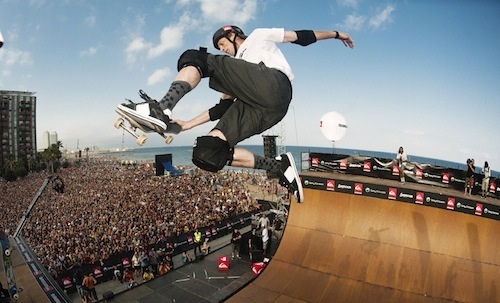 The fact that Tony Hawk was clearly a master of his discipline, coupled with his ability to market himself in a way in which no one else had ever done in the sport, has meant that he has been able to earn far, far more than other sportsmen in the same sport. The simple answer to this question is no… probably! A number of elements came together to allow Tony Hawk to make so much money. A great economy at the time, an explosion of interest in skateboarding, a huge rise in the number of people buying video games, a huge change in the quality and realism of such games, his ability both on and off the vert ramp, and of course his business acumen all came together to create a remarkable achievement. Will the stars ever align so perfectly for anyone else with such a natural talent both for sport and business? It’s highly unlikely, and Tony Hawk will probably go down as both the richest and most influential skateboarder of all time. This entry was posted in Land Sports, Skateboarding and tagged Skateboarder, Skateboarding, Tony Hawk. Bookmark the permalink.